iRealHousewives | The 411 On American + International Real Housewives: Is The Real Housewives Of San Antonio Really Happening?! Is The Real Housewives Of San Antonio Really Happening?! 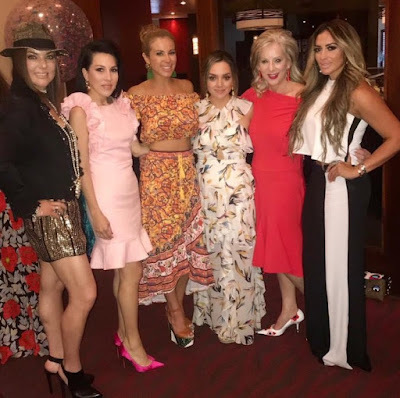 Over the weekend, a buzz was circulating all over social media that The Real Housewives of San Antonio has commenced filming after Ashley Paredez of the local Fox 7 News shared a video on Twitter, which some ladies were spotted filming scenes for the upcoming reality show. Back in April, Bravo confirmed that they've commissioned the show during their 2018/2019 Upfronts for NBCUniversal under the working title, Untitled San Antonio Project. According to NBCUniversal's press release via Bravo, the new docuseries "follows a tight knit group of women and their families living in San Antonio, Texas, who are affluent, sophisticated U.S. citizens or recently naturalized citizens of Mexican decent. In their upscale and beautiful gated communities, these women will face a new set of challenges in adapting to US culture while working to keep their roots alive and well." LALATE reports that the title may remain uncertain at the moment, " it may ultimately not carry a Real Housewives badge." If you recall, The Real Housewives of Dallas was initially commissioned by Bravo as Ladies of Dallas, a spin off of Ladies of London before Bravo changing their minds and adding it to the Real Housewives franchise, so anything is possible. Many of the potential cast members for the upcoming new series were identified on social media over the weekend. According to The Bravo Boy, the ladies that have been spotted filming are Luz Ortiz, Karla Ramirez, Penelope Ayarzagoitia, Lorena (Unknown last), Janet Montagne, Anayancy Nolasco and Mayra Farret. In America, the franchise has expanded in nine cities: Orange County, New York City, Atlanta, New Jersey, D.C., Beverly Hills, Miami, Potomac and Dallas. Meanwhile the franchise continues to grow worldwide with over seven installments: Athens (Greece), Vancouver and Toronto (Canada), Les Vraies Housewives (France), Melbourne and Sydney (Australia), Cheshire (United Kingdom), and Auckland (New Zealand). NBCUniversal confirmed back in 2016 that Thailand’s Kantana Group has commissioned the first Asian version of the franchise with The Real Housewives of Bangkok. Meanwhile early this year, M-Net confirmed that they had picked up the format licensing rights for a local South African version of the hit reality franchise. It's not unknown what exactly the show's title would be and where it would be set in. Andy Cohen previously revealed where the Real Housewives shows that could have been. “There are a lot of cities that we’ve cast in. People don’t know this,” Andy told Access Hollywood back in December 2016. So where did Bravo look for potential Housewives? “We’ve cast in Greenwich, Connecticut, San Francisco, the wine country. We’ve cast all over the place. We have cast in Houston, where we didn’t wind up doing it, so there have been versions that never made it,” said Andy. Are you looking forward to San Antonio being the next Real Housewives city if Bravo makes it happen? Sound off in the comments below!